- Cordless, battery-powered and very lightweight. - No computer needed to scan. - Directly save JPEG file to SD™ card, standard USB key or internal memory (512MB). - All your scanned business cards are automatically retyped. - Recognize business cards from 218 different countries. - 19 user interface languages. - Microsoft Outlook. - Address Book (Mac). - Sage Act! - Google™ Contacts. - Microsoft Excel. - Microsoft Dynamics CRM. - SalesForce. Full mobility is the word! 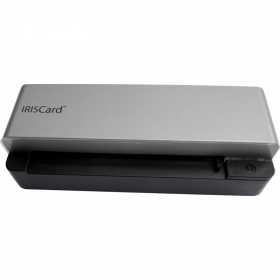 The IRISCard™ 5 enables on-the-go users to easily capture information from their business contacts when away from their computer. Ideal for today's mobile lifestyle, it turns contact management into a child's play.